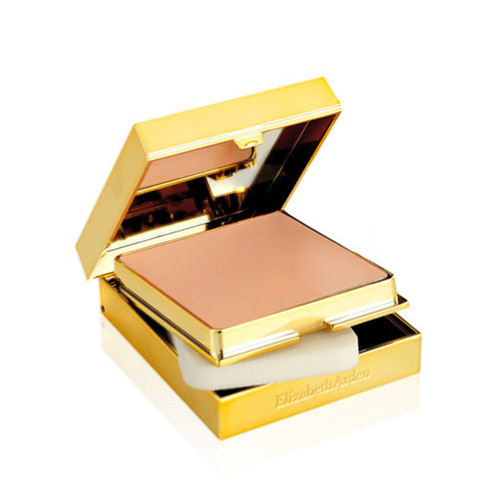 Elizabeth Arden’s best-selling foundation is now infused with micronized diamond powder to reflect light, instantly diminish discolorations and fine lines to give you a perfectly even, radiant finish. Flawless Finish Sponge-On Cream Makeup has a creamy texture that goes on effortlessly for a flawless, radiant finish. Infused with micronized diamond powder, this light-reflecting cream foundation manipulates and scatters light to diffuse the look of imperfections. Immediately, the look of fine lines, pores, blemishes, scars and dark spots are diminished. Skin appears smoother and more even in tone, as luminosity and radiance are boosted. This moisturizing cream formula offers medium to full coverage that feels comfortable and lasts all day. Key Ingredients: Micronized Diamond Powder: Made of real diamonds, this formula reflects light rather than absorbing it. Moisturizing formula: Medium to full coverage that feels comfortable and lasts 12 hours. Soft Focus Microsphere: Light-diffusing particles perfect the look of skin by bending and refracting light which instantly diminishes the look of fine lines, pores, blemishers, scars and dark spots Applications and Use Apply Flawless Finish Sponge-On Cream Makeup for a flawless application and airbrush effect. Use the smaller end of the brush to perfect areas around the nose, eyes, and mouth. FULL SIZE: 23 g PRICE: PHP 2350 AVAILABLE AT: Trinoma Shangri-la Plaza Mall Alabang Town Center Eastwood Mall SM Mall of Asia SM Makati Robinsons Place Manila SOCIAL MEDIA: Instagram: @elizabetharden_ph Facebook: Elizabeth Arden Online: BeautyMNL & Zalora PH Grab yours now at Sample Room!